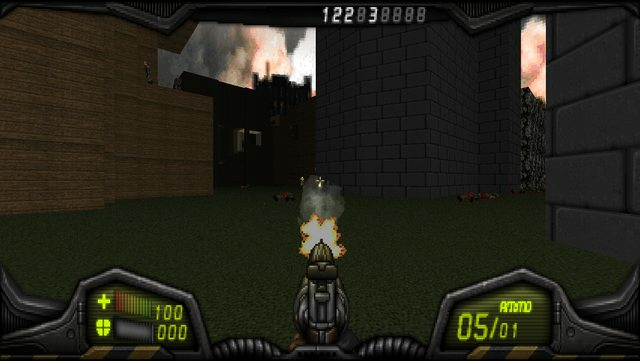 Accessories to Murder is a simple-ish mod for ZDoom (or GZDoom - Zandronum not supported, sorry!) based on the Doom Nukem Brutal Doom pack. Essentially, I took the Test 3 version of DNBD, threw out all of the Decorate code and started from the top. 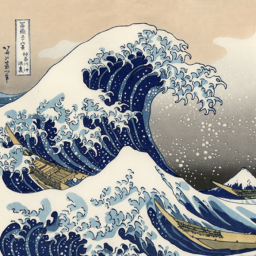 Download the most recent Stable release here, or the bleeding-edge version from Github. There is reloading, and it is CLIP-based, not BULLET-based (except for the shotguns). So keep those itchy reload fingers at bay. All of the new weapon graphics and most of the items are by Doom Nukem. I literally could not have made this mod without his approval. Hey, fellow authors, if you want to use stuff from this mod, be sure to ask both me AND Doom Nukem for permission (since DN did the graphics and I did the code). I could gladly provide an edge in the terms of refining BFG effect. -If you fire one barrel of the Sawed-off Shotgun and then reload, you will see that you fire the left-hand barrel but load a shell into the right-hand barrel, it just looks rather strange though it's just a minor nitpick. -Another thing about the Sawed-off is that I feel like it's missing the classic Double-Barrel blast, you know? When you fire both barrels at the same time? Otherwise this is a pretty fun little mod with some very high-quality sprites [props to Doomnukem]. I'm definitely liking it, the only issue I've found is that when you manually reload while aiming down the sights with the shotgun, it plays the dryfire state before reloading. Mikk- wrote: -If you fire one barrel of the Sawed-off Shotgun and then reload, you will see that you fire the left-hand barrel but load a shell into the right-hand barrel, it just looks rather strange though it's just a minor nitpick. A nitpick that you are quite right to point out. Will fix in a moment. Just hold the trigger down, the barrels go off quickly enough that you barely need a real double blast. Also bear in mind that I swapped the shotguns around; the sawed-off replaces the regular shotgun. Keralastic wrote: I'm definitely liking it, the only issue I've found is that when you manually reload while aiming down the sights with the shotgun, it plays the dryfire state before reloading. Fixed; only took moving a couple of lines around, really. No idea why I didn't fix it before. A very nice implementation of these good looking sprites. Good fun. I may as well mention a pet peeve of mine here. Shotguns and slow reloading. 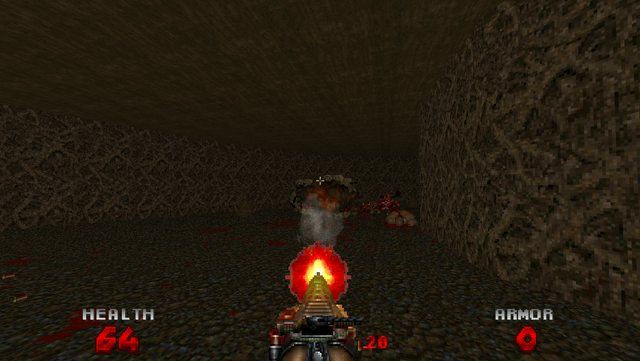 I'm a fan of the Doom single shotgun and I know that shotguns are not high on a number of weapon modders favourites lists but there is, IMO, a nice balance between the two shotguns in vanilla Doom. The SSG is a very powerful weapon (especially close up) and many people consider the single shotgun redundant once they have picked up the SSG. I beg to differ, I really like the standard shotgun and I feel that it very much has its place in the arsenal. It doesn't have the stopping power of its double barrelled brother but its quicker rate of fire makes it far more useful against groups of low HP (possibly rapid-firing) enemies IMO. Even against some of the bigger bad guys, the rate of fire is sufficient that the single shotgun can put the enemy into its pain state frequently enough that the weapon is still sometimes worth considering over the more powerful SSG. (And, of course, the tighter spread makes it a little more useful at longer distances too, but that's not the point of this rant-ette.) The single shotgun is my "go to" weapon of choice, primarily because of the rate of fire aspect of this balance. So, why am I mentioning this? Because, almost without exception, weapon mods that feature reloading destroy this balance. Most of the time, a SSG-like weapon is featured and, much like the original, after firing the player quickly slams in a couple of replacement shells and the weapon has a similar rate of fire to the original combined with the awesome stopping power of two shells at once. The single shotgun, however, gets saddled with an annoyingly slow "fill the weapon with shells one by one every few shots" reload. It's not too terrible in this mod because the shotgun only has a 5 shell capacity versus the usual 8 (though this does mean reloading needs to happen more frequently). This type of reloading system reduces the average rate of fire of the single shotgun by making it so that for a number of seconds each "clip", the weapon is unable to fire. If you can't do the job in 5 (or 8) shots, then you are going to need to plan for some way of withdrawing for a few seconds while you wait for the weapon to be refilled. Compare this to the not-crippled-at-all-by-the-reloading-system SSG and, as a single shotgun fan, I can see little reason to use the single shotgun for any fight unless shotgun ammo is particularly scarce. Surely there has to be some way of allowing shotgun reloads without removing the main thing that normally makes the shotgun a viable choice even when you are carrying a SSG? As I said, systems like the one in this mod leave the SSG almost unscathed yet cripple the single shotgun and thereby ruin a fine balance and make the single shotty virtually redundant. Right, peeve aired. Back to appreciating this rather nice little mod. Funny you bring that up, Enjay; I am attempting to remedy this balance issue with, as mentioned above, a swap of the shotguns. The regular shotgun is now replaced with the sawed-off. Its main advantage over the pump shotgun is crowd control; it has a much wider spread and a high knockback, in addition to its quick reloading. However, due to the wide spread and comparative lack of damage, the sawed-off is not generally useful at longer ranges. The Super shotgun is now replaced with the pump-action, whose main benefits over the sawed-off are that it is far more accurate (aim down the sight to use it as an ersatz sniper weapon, a tactic that is actually feasible with the tight spread) and has a lot more power, and can actually put down demons in one well-placed shot. However, due to the relatively slow speed and lengthy reloads, as well as the tight spread necessitating more time spent on aiming, the pump shotgun is less useful in close quarters. It should be noted, though, that as this is an SSG replacement, it has been powered up considerably. I guess you could always do what Doom 3 did and feed in 2 shells at a time to cut down reload time a bit. Though I've never actually been hindered by shotgun reloads in the mods that have them, since you can usually cancel the reload and fire off a shot as needed. 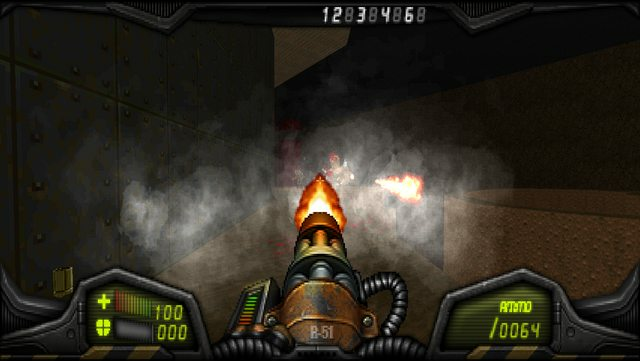 EDIT: I'm not sure if I like the shotgun swap, the sawn off just doesn't feel like it has the utility of the pump shotgun, but that's just my opinion after playing a few levels of Doom 2. Best sound effect for a pump shotgun ever. Overall it's one of the most fun-to-use weapons in a Doom mod for me. I don't even mind that it takes eons to reload because of it's long range capability. I do think that the sawed-off should have a bit wider bullet spread though. The grouping is just as tight as the pump-action, when the barrel is half the length. Widening the spread would make it the the go-to gun for a full room of close range lowbies, as well as necessitate switching to the pump when there's more distance between you and the enemy. Also, I love what you've done with the hammer, but it should be switched to after picking up a berserk pack, I want nothing more than to gib an imp with that thing! Lippeth wrote: I do think that the sawed-off should have a bit wider bullet spread though. Hmm, not sure where you're getting that from unless the RNG is really in your favor...the pump shotgun's spread is X 2, Y 2, while the sawed-off has X 7, Y 4 - a bit more than twice as much. Maybe I should up the spread a lot and then give it another half point of damage. Well, that's odd... I don't remember DoomNukem making this many weapon sprites for his weapon expansion for Brutal Doom. Edit: Just played around with it a bit. And man, these are some beefy sounds you've got here. How did you manage to get sounds like these? The hardest part for me when I'm creating weapons, is finding the proper sound effects. Ctrl+Alt+Destroy wrote: Well, that's odd... I don't remember DoomNukem making this many weapon sprites for his weapon expansion for Brutal Doom. It's my understanding that the rocket launcher and BFG were originally to be put in the BD pack but were not implemented yet before he canned that version. When I PM'd him about it, he sent me the graphics to use. A lot of these sounds actually come from mods for other FPS games; most of the bullet weapons' sounds come from the Killing Floor IJC Weapon Pack (from before it was officially added into the game in an update), with the pump shotgun's firing sound being from the original Borderlands. Beyond that, the rocket launcher's sounds are mainly sourced from packs on Gamebanana for TF2, the Chaingun's are from Medal of Honor: Pacific Assault (I maintain they're the best part of that game), and the BFG's are primarily sourced from Freesound (though BouncyTEM provided two nice, subtle sounds for its pickups). Ctrl+Alt+Destroy wrote: Ah, so you do a lot of digging, I assume?